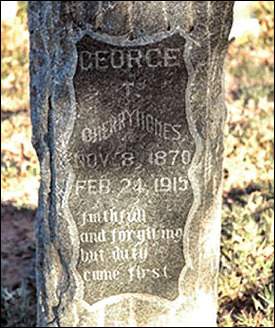 Those are the words on the tombstone of George Thomas Cherryhomes at Oak Grove Cemetery in Graham, Young County, Texas. He was born, the engraving says, on 8 November 1870. He died 100 years ago this coming Tuesday, on the 24th of February 1915. But sometime between the enumeration of that census in April of 1910 and the early days of 1915, Tom began doing something other than farming. At some point before a fateful night, 100 years ago, in February 1915, he had become a deputy sheriff in Young County. And he was on duty in the early morning hours of 24 February 1915. 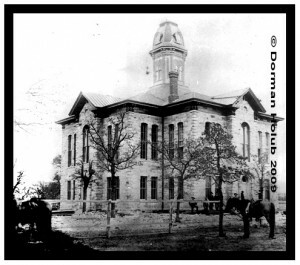 At about 3:30 a.m. on that Wednesday, the lawmen heard noises from the area of the cistern outside the courthouse. They went to investigate and were confronted by four armed men, who ordered them to surrender. Contemporary accounts quoted Tom as saying he’d “never” throw up his hands. He and Dollins opened fire; the armed men returned fire. End of Watch February 24, 1915. Rest in peace, Tom. Rest in peace. First published 23 February 2013; repeated to honor the 100th anniversary of Tom’s death. Courthouse photo used with permission of Dorman Holub. Tombstone photo used with permission of Kay Douglas. It means distantly (and usually indefinitely) related, Joe. I haven’t researched Tom’s ancestors, Carol: it’s his wife who is actually my cousin. But your theory as to his ancestry sounds right.